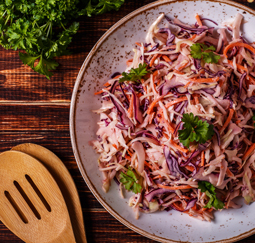 Asian Coleslaw - A recipe from Savor California, the online showcase for extraordinary gourmet foods and beverages from California. Mix all of the vegetables, half of the peanuts, and cilantro, tossing in a large bowl. In the second bowl, mix the oil and the vinegar, then the spices, and last, slowly stir in sugar. Pour the sauce over the vegetables and mix well. Garnish with rest of peanuts and sprig of cilantro.